Target phone tracking also uses algorithms. When an IMSI catcher detects phones within range, it simply indicates that a device is located within a given radius. But for observers to exactly locate a mobile phone user requires certain methods, most of which use multiple, geographically separate sensors and calculation algorithms. 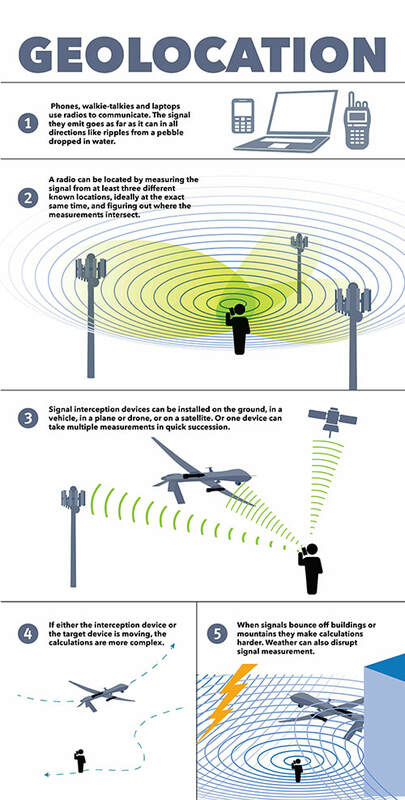 Drones and other surveillance aircraft carry IMSI catchers that collect information about intercepted signals like the direction, or angle, it arrived from, the exact time it arrived and the signal’s frequency. Each measurement provides valuable information for calculating the estimated location of phones. For example, pilots rarely have an exact lock on the location of drones since their on-board GPS can only provide latitude and longitude, but not the drone’s exact altitude or the angle of travel. A drone with a badly calibrated gyroscope (used to stabilize the aircraft) or a relay satellite that has drifted even slightly off course can throw off calculations, as can a phone signal that has bounced off buildings or mountains. Locating the sources of radio signals has long been a military goal. Guardrail, one of the key predecessors of modern phone geolocation systems, was first used in Germany in 1971 to monitor Soviet troop movements in Eastern Europe. Still in use today, Guardrail employs three piloted Beechcraft C-12 Huron aircraft flying in orchestrated patterns to intercept selected low-, mid-, and high- band radio signals.105 Data from the three aircraft are sent back to ground stations, which then calculate the location of the "emitter." Unfortunately, flying multiple drones in orchestrated patterns is not easy when the pilots are on the other side of the world. Rather than rely on three imperfect drone readings, then, analysts sometimes request help from the National Reconnaissance Office’s (NRO) dedicated military satellites. The details of such support are not public, but there is some evidence it might come from a secretive program: Airborne Overhead Cooperative Operations (AOCO). Literature on the accuracy of drone geolocation of phones is somewhat sparse because of the clandestine nature of this kind of research. (By comparison, drone hobbyists have easy access to video, radar and infrared technology, and thus to data.) But it is clear from publicly available military research that one drone, flying alone, cannot reliably track mobile phones below. The accuracy of such a system, Hale writes, will increase with the number of drone patrols used to gather signals. For example, a system of 10 combat air patrols (a minimum of 20 drones) flying at 15,000 feet can track only 20 targets in a country the size of Afghanistan with an accuracy rate of 25 percent. But Hale believes that if the Pentagon could simultaneously fly a minimum of 40 drones (20 combat air patrols) in complementary orbits at 30,000 feet, the Pentagon could reach 95 percent accuracy over Afghanistan. Even this estimate comes with several caveats, the first being that Hale assumed for purposes of her calculations that Afghanistan was flat. Second, it should be remembered that the higher a drone flies, the lower the quality of the video signal. So the advantage of higher altitude tracking would have to be weighed against the disadvantage of not being able to see the targets. Not least is the significant number of drones needed to fly simultaneously in order to ensure accuracy under Hale’s plan. "Civilian and military intelligence has been used at the strategic level to locate [Kurdish forces], but without operational and tactical location systems, success is fleeting at best," Tas writes. "The system should include at least four stationary and one flying UAV [drone] as the fifth receiver for better accuracy." The problem with this approach is that it needs direct access to ground monitoring sensors, which may not always be available to U.S. troops in Pakistan or Yemen. (For example, the Waziristan mobile network is often turned off. )110 If dedicated interception devices are installed at convenient locations or even mounted on vehicles, this method may work but it will still not be 100 percent reliable. It should be noted that Predators and Reapers do not carry equipment on board to calculate the location of a phone. Instead this task has to be conducted on the ground by computer systems powerful enough to crunch the data using algorithms like the Interacting Multiple Model to correct for errors in each measurement. The problem was that Netezza didn’t make the software the CIA wanted, but hoped to re-sell the spy agency a proprietary geospatial package made by Intelligent Integration Systems (IISi), a small Boston-based company. This software had been licensed to the bigger company for use on the older Netezza Performance Servers but was discovered not to work on the newer TwinFins.